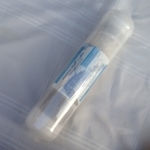 Using the two clips, an inline 2.5" diameter (alkaline or DI) filter can be attached to the 2" diameter post carbon filter in a Reverse Osmosis System. 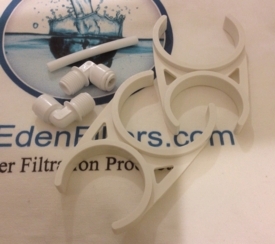 Using the short 1/4" tube, the inlet to the added inline filter can be connected to the outflow from the inline carbon filter. This Kit is used to change a five stage Reverse Osmosis System (RO5-100) to six stage Alkaline RO System (RO6-100-ALK).